Iedereen die betrokken is bij onze school is hierop van harte welkom! Er zijn lekkere hapjes en drankjes aan diverse kraampjes. Voor de kinderen is er heel wat animatie én je kan deelnemen aan de Sint-Maurtius Cup! Kom zeker meegenieten vanaf 16.00 uur. Samen wordt het een gezellige en leuke afsluiter van een mooi schooljaar! 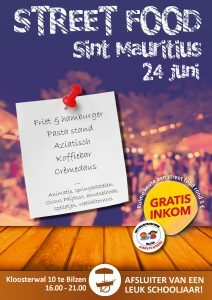 bij het nakijken van de agenda van mijne zoon, zag ik helaas dat het strookje om ons in te schrijven voor het street food festival er nog in zat. zouden wij via deze weg nog kunnen inschrijven? we zijn met 5 personen waarvan 3 kinderen. wij houden van Aziatisch, pasta en frieten. Seppe en Arne zouden graag een team vormen voor het voetbaltoernooi. Helpful info. Lucky me I discovered your web site accidentally, and I am shocked why this accident didn’t came about earlier! media print, we all be aware of media is a impressive source of information. Good respond in return of this difficulty with solid arguments and telling the whole thing regarding that. soon. I want to encourage that you continue your great writing, have a nice evening! important. A lot more people really need to look at this and understand this side of your story. I have learn this submit and if I may I wish to recommend you some interesting issues or tips. Studying this information So i am satisfied to express that I have a very excellent uncanny feeling I discovered exactly what I needed. P8jsWw This excellent website certainly has all of the information and facts I wanted concerning this subject and didn at know who to ask. I抦 impressed, I must say. Really not often do I encounter a blog that抯 each educative and entertaining, and let me let you know, you’ve got hit the nail on the head. Your concept is excellent; the problem is something that not sufficient individuals are talking intelligently about. I am very happy that I stumbled throughout this in my seek for something referring to this. I intended to put you that little note so as to give many thanks as before for those beautiful pointers you’ve provided above. It is shockingly generous of people like you to grant unreservedly precisely what most people could have offered for sale for an electronic book to earn some money for themselves, even more so considering the fact that you could have done it if you desired. These strategies likewise served to be the fantastic way to understand that other individuals have a similar interest like my personal own to see many more around this problem. I am sure there are a lot more pleasant periods ahead for those who look over your blog post. I wanted to make a note to be able to thank you for all of the fantastic tips and tricks you are sharing here. My extended internet search has now been recognized with really good knowledge to exchange with my co-workers. I would express that we visitors are unquestionably blessed to exist in a magnificent network with many lovely professionals with interesting strategies. I feel somewhat fortunate to have come across the webpage and look forward to tons of more excellent minutes reading here. Thank you again for a lot of things. Spot on with this write-up, I truly assume this web site needs way more consideration. I抣l in all probability be again to learn far more, thanks for that info. I am glad for writing to let you know of the superb encounter my friend’s princess had reading through your site. She noticed numerous issues, including what it’s like to have an amazing giving style to get the mediocre ones without problems know some advanced things. You actually exceeded readers’ desires. Many thanks for showing such powerful, trusted, edifying and in addition fun guidance on the topic to Lizeth. I simply desired to appreciate you yet again. I do not know what I might have followed in the absence of those aspects documented by you about my field. It had been a very depressing crisis for me personally, nevertheless looking at this professional mode you managed that forced me to weep with gladness. I’m grateful for the information and believe you realize what an amazing job you have been providing teaching other individuals via your blog post. I know that you have never got to know all of us. This website is known as a stroll-via for the entire info you wanted about this and didn抰 know who to ask. Glimpse here, and you抣l undoubtedly discover it. I definitely wanted to type a brief remark to be able to thank you for these marvelous hints you are writing on this site. My prolonged internet research has at the end of the day been honored with awesome facts and strategies to share with my classmates and friends. I ‘d assert that many of us website visitors actually are very much fortunate to be in a fabulous network with many special individuals with great tips and hints. I feel quite grateful to have discovered your entire web page and look forward to many more brilliant moments reading here. Thank you once more for everything. I just want to mention I am newbie to weblog and seriously loved you’re blog. Almost certainly I’m want to bookmark your site . You surely come with very good articles and reviews. With thanks for sharing your web site. I really wanted to write down a brief word so as to express gratitude to you for those remarkable tips you are showing on this site. My long internet search has now been rewarded with reliable content to talk about with my pals. I would say that most of us visitors are undeniably fortunate to exist in a good place with very many lovely individuals with helpful secrets. I feel truly lucky to have discovered the webpage and look forward to tons of more amazing minutes reading here. Thank you once again for everything. Usually I don’t learn post on blogs, but I would like to say that this write-up very compelled me to try and do so! Your writing taste has been amazed me. Thanks, very great post. I’m typically to running a blog and i really admire your content. The article has actually peaks my interest. I’m going to bookmark your web site and preserve checking for brand new information. I am only writing to make you know what a impressive encounter my cousin’s child had reading your web site. She figured out lots of issues, which include what it is like to possess an excellent coaching heart to get many more with ease completely grasp selected problematic subject areas. You actually did more than visitors’ expected results. Thank you for providing those informative, trusted, informative and unique tips about that topic to Jane. I see so now i am following you. Look forward to looking at your web page yet again. I simply needed to appreciate you once more. I am not sure the things that I would have sorted out in the absence of the smart ideas shared by you over such a theme. Entirely was a frightening issue for me, nevertheless being able to see this expert approach you solved that took me to cry for joy. I’m just happy for this guidance and then expect you recognize what an amazing job you are always undertaking instructing some other people using your websites. More than likely you haven’t met all of us. I want to show my respect for your generosity in support of those people that require help on this particular niche. Your personal dedication to passing the solution all over had been extraordinarily interesting and has continually made women just like me to realize their ambitions. Your amazing useful facts indicates much to me and extremely more to my fellow workers. Warm regards; from each one of us. naturally like your web-site but you have to check the spelling on quite a few of your posts. Many of them are rife with spelling problems and I find it very bothersome to tell the truth nevertheless I will definitely come back again. “pop”! Your content is excellent but with images and clips, this blog could undeniably be one of the greatest in its niche. Hello very nice blog!! Guy .. Excellent .. Amazing .. I’ll bookmark your blog and take the feeds additionally…I’m glad to find a lot of useful info here in the put up, we’d like work out extra techniques in this regard, thank you for sharing. Hi my family member! I wish to say that this article is amazing, great written and come with approximately all significant infos. I’d like to look more posts like this. Hi my friend! I want to say that this post is awesome, great written and come with almost all significant infos. I’d like to peer extra posts like this. I’ve read some good stuff here. Certainly value bookmarking for revisiting. I surprise how so much effort you place to create this type of fantastic informative website. I needed to put you a very little observation to finally give many thanks yet again about the lovely ideas you have documented on this page. It has been certainly surprisingly open-handed of you giving freely precisely what a lot of folks might have distributed for an ebook to generate some profit for their own end, and in particular considering the fact that you could have tried it if you ever considered necessary. These tips in addition worked to become great way to recognize that someone else have similar fervor really like my personal own to realize a lot more regarding this issue. Certainly there are many more pleasant occasions ahead for many who go through your blog post. You can certainly see your expertise in the paintings you write. The sector hopes for even more passionate writers such as you who are not afraid to mention how they believe. Always go after your heart. “The only way most people recognize their limits is by trespassing on them.” by Tom Morris. I really enjoy examining on this site, it holds great articles . “It is easy to be nice, even to an enemy – from lack of character.” by Dag Hammarskjld. wonderful post, very informative. I ponder why the other specialists of this sector don’t understand this. You must continue your writing. I’m sure, you have a great readers’ base already! Throughout the great pattern of things you’ll secure an A+ with regard to effort. Exactly where you misplaced me was on the specifics. As it is said, details make or break the argument.. And that couldn’t be much more true here. Having said that, permit me inform you precisely what did give good results. The text can be incredibly convincing and this is probably the reason why I am taking an effort in order to comment. I do not make it a regular habit of doing that. Second, even though I can certainly notice a leaps in reason you make, I am definitely not sure of exactly how you appear to connect your ideas that make the actual final result. For right now I will yield to your point however wish in the future you actually connect the facts much better. Thank you, I have recently been looking for information about this topic for a while and yours is the greatest I’ve came upon so far. But, what in regards to the bottom line? Are you sure about the source? certainly like your web-site but you have to check the spelling on quite a few of your posts. Many of them are rife with spelling problems and I in finding it very bothersome to inform the truth on the other hand I’ll surely come again again. Thanks, I’ve recently been searching for information about this subject for ages and yours is the best I’ve found out till now. But, what about the bottom line? Are you sure concerning the source? Whats up very nice blog!! Guy .. Beautiful .. Amazing .. I will bookmark your site and take the feeds also…I’m happy to seek out so many useful info right here in the publish, we want work out more techniques on this regard, thank you for sharing. Some genuinely wonderful blog posts on this site, thank you for contribution. “A conservative is a man who sits and thinks, mostly sits.” by Woodrow Wilson. I want to convey my respect for your kind-heartedness in support of men and women who really want assistance with this important niche. Your special commitment to getting the message all around appears to be exceedingly insightful and have continuously encouraged men and women like me to reach their endeavors. Your amazing invaluable hints and tips entails so much a person like me and extremely more to my office workers. Thanks a lot; from each one of us. Wonderful web site. Plenty of helpful information here. I¡¦m sending it to a few buddies ans additionally sharing in delicious. And of course, thanks for your sweat! I have to show my respect for your kind-heartedness in support of those individuals that absolutely need help on this matter. Your real commitment to passing the message all over became surprisingly powerful and have continuously enabled women much like me to arrive at their objectives. Your entire helpful report means a lot a person like me and somewhat more to my office colleagues. With thanks; from everyone of us. I have been surfing online greater than 3 hours nowadays, but I by no means discovered any attention-grabbing article like yours. It is beautiful price enough for me. In my view, if all web owners and bloggers made just right content as you probably did, the net shall be a lot more helpful than ever before. “Nothing will come of nothing.” by William Shakespeare. I simply wanted to write down a message to be able to appreciate you for these remarkable steps you are showing on this website. My prolonged internet investigation has at the end been compensated with good quality knowledge to talk about with my co-workers. I would assume that most of us readers actually are undeniably lucky to be in a superb place with very many brilliant individuals with valuable points. I feel really grateful to have used your website and look forward to really more excellent times reading here. Thanks again for everything. Thank you for your whole labor on this blog. Betty enjoys setting aside time for research and it’s easy to understand why. All of us know all regarding the dynamic mode you render both useful and interesting secrets via this web blog and even inspire contribution from people on that subject while my simple princess is actually being taught so much. Have fun with the remaining portion of the new year. You are performing a really great job. I will immediately grab your rss feed as I can’t in finding your e-mail subscription link or newsletter service. Do you’ve any? Please let me understand in order that I may subscribe. Thanks. A person necessarily help to make seriously posts I might state. That is the very first time I frequented your website page and thus far? I amazed with the research you made to make this particular put up extraordinary. Fantastic job! Simply desire to say your article is as astounding. The clearness in your post is simply spectacular and i could assume you’re an expert on this subject. Well with your permission allow me to grab your feed to keep updated with forthcoming post. Thanks a million and please continue the gratifying work. I was very pleased to discover this page. I wanted to thank you for your time for this wonderful read!! I definitely enjoyed every part of it and i also have you saved as a favorite to check out new stuff on your website. I am also commenting to let you understand of the terrific discovery my wife’s daughter undergone reading through your web page. She even learned a lot of issues, most notably what it’s like to possess an amazing coaching heart to make a number of people effortlessly know just exactly chosen grueling subject areas. You undoubtedly did more than readers’ expectations. Thank you for presenting those effective, safe, revealing and fun thoughts on your topic to Emily. Thank you for another magnificent post. Where else may anyone get that kind of info in such an ideal method of writing? I have a presentation subsequent week, and I’m at the look for such info. Hiya, I am really glad I have found this information. Today bloggers publish only about gossips and net and this is actually frustrating. A good blog with interesting content, that’s what I need. Thank you for keeping this website, I’ll be visiting it. Do you do newsletters? Cant find it. I as well as my pals were actually following the excellent helpful tips from your web page while at once came up with an awful feeling I never expressed respect to the web blog owner for those techniques. All the people appeared to be for this reason very interested to read through them and have simply been enjoying these things. Thank you for indeed being so helpful and also for picking out this form of amazing topics most people are really needing to be aware of. My personal sincere apologies for not expressing appreciation to earlier. Highly stimulating information you have remarked, thanks so much for setting up. You actually make it appear really easy along with your presentation however I in finding this topic to be really one thing which I think I’d by no means understand. It seems too complex and very wide for me. I’m looking ahead on your next put up, I¡¦ll try to get the hang of it! Gday there, just got conscious of your blog site through Bing, and found that it is very good. I will truly appreciate should you keep up this idea. excellent points altogether, you just won a new reader. What would you recommend in regards to your submit that you made a few days ago? Any certain? Somebody essentially help to make seriously articles I might state. That is the very first time I frequented your web page and to this point? I surprised with the research you made to create this particular put up incredible. Fantastic task! I simply could not depart your site prior to suggesting that I extremely enjoyed the usual info an individual supply to your visitors? Is going to be back incessantly to inspect new posts. certainly like your website but you need to test the spelling on several of your posts. A number of them are rife with spelling issues and I find it very troublesome to inform the truth on the other hand I will definitely come again again. It is really a great and useful piece of information. I am happy that you simply shared this useful info with us. Please stay us up to date like this. Thank you for sharing. Normally I don’t learn post on blogs, however I wish to say that this write-up very compelled me to check out and do it! Your writing style has been surprised me. Thank you, very nice article. Hiya, I’m really glad I’ve found this info. Nowadays bloggers publish only about gossips and net and this is actually annoying. A good site with interesting content, that’s what I need. Thank you for keeping this web site, I will be visiting it. Do you do newsletters? Cant find it. Just wanna remark on few general things, The website style and design is perfect, the articles is real fantastic. “The enemy is anybody who’s going to get you killed, no matter which side he’s on.” by Joseph Heller. I’m excited to uncover this great site. I need to to thank you for your time just for this fantastic read!! I definitely enjoyed every part of it and I have you bookmarked to see new things on your website. Hi there, I discovered your blog by the use of Google even as searching for a related topic, your website got here up, it seems to be great. I’ve bookmarked it in my google bookmarks. I simply needed to thank you very much once more. I am not sure what I would have taken care of in the absence of these solutions discussed by you concerning my field. It truly was a very troublesome issue in my view, nevertheless understanding your specialised fashion you processed the issue made me to weep over gladness. Now i am thankful for the work and even wish you are aware of a powerful job you are accomplishing instructing the rest with the aid of your blog post. I am sure you have never come across all of us. I was just seeking this info for a while. After 6 hours of continuous Googleing, finally I got it in your website. I wonder what is the lack of Google strategy that don’t rank this kind of informative sites in top of the list. Usually the top websites are full of garbage. certainly like your web site however you need to check the spelling on several of your posts. A number of them are rife with spelling problems and I to find it very bothersome to inform the reality on the other hand I¡¦ll certainly come back again. Hiya, I am really glad I have found this info. Nowadays bloggers publish only about gossips and net and this is really irritating. A good site with exciting content, this is what I need. Thank you for keeping this site, I will be visiting it. Do you do newsletters? Can not find it. Hi, Neat post. There is an issue along with your website in internet explorer, may check this¡K IE still is the market leader and a big portion of folks will miss your wonderful writing due to this problem. Hi, Neat post. There’s an issue together with your website in internet explorer, may check this¡K IE nonetheless is the marketplace chief and a huge component to folks will miss your wonderful writing because of this problem. Fairly insightful suggestions you have remarked, say thanks a lot for publishing. naturally like your website however you need to check the spelling on several of your posts. Several of them are rife with spelling problems and I in finding it very bothersome to tell the reality then again I¡¦ll definitely come back again. I am writing to let you know what a cool experience my friend’s daughter found viewing yuor web blog. She mastered some details, not to mention how it is like to possess a marvelous teaching style to let most people really easily know just exactly some complicated matters. You really did more than my expectations. Thanks for coming up with those helpful, trusted, edifying and unique tips on your topic to Jane. Hiya there, just turned out to be aware about your webpage through Search engine, and realized that it is quite informational. I will be grateful for should you decide carry on this approach. excellent issues altogether, you just won a new reader. What may you suggest in regards to your submit that you made some days in the past? Any positive? Hi my friend! I wish to say that this article is awesome, great written and include approximately all important infos. I would like to look more posts like this . I do believe all the ideas you’ve offered on your post. They’re really convincing and can definitely work. Nonetheless, the posts are too short for beginners. May just you please prolong them a bit from subsequent time? Thank you for the post. I will immediately grab your rss as I can’t find your email subscription hyperlink or e-newsletter service. Do you have any? Kindly allow me recognize so that I could subscribe. Thanks. I simply wanted to appreciate you once more. I’m not certain the things I could possibly have accomplished without the actual basics shared by you directly on my area. It has been a very scary crisis in my position, nevertheless being able to view the very specialised avenue you treated the issue forced me to weep over gladness. Extremely happy for this help and sincerely hope you are aware of an amazing job you are getting into teaching people through the use of your web page. I know that you’ve never encountered any of us. Hello my family member! I want to say that this article is awesome, great written and include approximately all significant infos. I would like to peer extra posts like this . you’re actually a just right webmaster. The site loading pace is amazing. It seems that you’re doing any unique trick. Also, The contents are masterwork. you have performed a great task in this matter! It¡¦s really a cool and useful piece of information. I¡¦m satisfied that you shared this helpful info with us. Please stay us informed like this. Thanks for sharing. I just could not leave your website before suggesting that I actually enjoyed the usual information a person supply in your visitors? Is going to be again incessantly in order to check up on new posts. Nice post. I was checking continuously this blog and I am impressed! Extremely helpful information specially the last part 🙂 I care for such info a lot. I was seeking this certain info for a very long time. Thank you and good luck. Simply desire to say your article is as astounding. The clearness in your post is just great and i could assume you are an expert on this subject. Fine with your permission allow me to grab your feed to keep updated with forthcoming post. Thanks a million and please carry on the gratifying work. you’re really a excellent webmaster. The website loading velocity is amazing. It seems that you’re doing any unique trick. Also, The contents are masterpiece. you have done a great task in this topic! Thank you so much for providing individuals with an exceptionally pleasant opportunity to discover important secrets from this web site. It is always very sweet and jam-packed with a lot of fun for me and my office friends to visit your blog at least 3 times in 7 days to learn the fresh items you have. Not to mention, I am certainly satisfied with all the superb guidelines you serve. Selected 2 areas on this page are in truth the simplest we have all ever had. You really make it seem so easy together with your presentation but I in finding this topic to be really one thing that I think I would never understand. It kind of feels too complicated and very wide for me. I’m having a look ahead in your subsequent publish, I will try to get the hang of it! hi!,I love your writing so a lot! percentage we keep in touch more approximately your article on AOL? I require an expert in this area to unravel my problem. Maybe that is you! Having a look forward to look you. It is really a nice and helpful piece of information. I¡¦m satisfied that you shared this helpful information with us. Please stay us up to date like this. Thank you for sharing. I and my buddies were checking the good guidelines from your website then immediately came up with an awful suspicion I had not thanked the website owner for those secrets. Most of the guys were as a consequence joyful to read through all of them and have in effect certainly been taking advantage of these things. We appreciate you truly being well thoughtful as well as for choosing certain tremendous tips most people are really desirous to learn about. My sincere apologies for not expressing gratitude to you earlier. It¡¦s in reality a great and useful piece of information. I am glad that you just shared this useful info with us. Please stay us up to date like this. Thanks for sharing. I have been browsing online more than 3 hours lately, yet I never found any attention-grabbing article like yours. It is lovely worth sufficient for me. In my opinion, if all website owners and bloggers made excellent content as you probably did, the web will probably be much more useful than ever before. It is in point of fact a nice and useful piece of info. I am satisfied that you just shared this useful information with us. Please keep us up to date like this. Thank you for sharing. Great tremendous things here. I am very satisfied to see your post. Thank you a lot and i’m looking ahead to contact you. Will you kindly drop me a mail? Fantastic website. Plenty of helpful info here. I am sending it to several pals ans additionally sharing in delicious. And obviously, thank you to your effort! Fantastic goods from you, man. I’ve understand your stuff previous to and you’re just extremely great. I really like what you’ve acquired here, really like what you’re stating and the way in which you say it. You make it entertaining and you still care for to keep it smart. I can not wait to read far more from you. This is actually a tremendous site. Great post. I was checking constantly this blog and I’m impressed! Extremely useful info particularly the last part 🙂 I care for such info much. I was looking for this certain information for a long time. Thank you and good luck. Thanks for some other informative blog. Where else could I am getting that kind of information written in such an ideal manner? I have a project that I am simply now working on, and I have been at the look out for such information. Whats Going down i am new to this, I stumbled upon this I have found It absolutely helpful and it has aided me out loads. I hope to give a contribution & help other users like its aided me. Good job. It¡¦s in reality a nice and helpful piece of information. I am happy that you simply shared this useful information with us. Please stay us informed like this. Thank you for sharing. I wanted to send you that bit of note just to thank you very much once again regarding the gorgeous pointers you’ve contributed here. This is quite seriously generous with you to provide unhampered just what many of us could possibly have sold as an ebook in order to make some bucks on their own, notably seeing that you might well have done it in case you decided. Those creative ideas additionally worked to be a good way to be sure that most people have the identical passion the same as my personal own to realize significantly more around this matter. I believe there are a lot more pleasant instances ahead for individuals that browse through your site. Thank you for sharing excellent informations. Your web site is very cool. I am impressed by the details that you¡¦ve on this website. It reveals how nicely you understand this subject. Bookmarked this website page, will come back for extra articles. You, my friend, ROCK! I found simply the info I already searched everywhere and simply could not come across. What a great site. Wonderful blog! Do you have any helpful hints for aspiring writers? I’m planning to start my own site soon but I’m a little lost on everything. Would you recommend starting with a free platform like WordPress or go for a paid option? There are so many options out there that I’m completely confused .. Any suggestions? Kudos! Needed to create you one bit of word so as to say thank you over again for the pretty guidelines you’ve shared here. It is really strangely open-handed with people like you in giving easily precisely what a few people would have marketed as an electronic book to get some bucks for their own end, certainly given that you might well have done it in the event you considered necessary. Those pointers additionally served like the fantastic way to fully grasp that many people have similar desire similar to my personal own to know the truth a little more with respect to this problem. I think there are several more pleasant instances up front for folks who looked over your website. life to listen news on Television, therefore I only use web for that reason, and take the latest information. I was examining some of your content on this website and I think this site is very instructive! Continue putting up. You actually make it seem really easy together with your presentation however I find this topic to be really something which I think I’d by no means understand. It seems too complex and extremely huge for me. I’m having a look forward on your next put up, I¡¦ll attempt to get the grasp of it! What i do not understood is in fact how you are no longer actually much more neatly-favored than you may be right now. You are very intelligent. You already know therefore significantly on the subject of this matter, produced me individually consider it from so many varied angles. Its like women and men are not interested except it’s one thing to do with Girl gaga! Your personal stuffs great. All the time maintain it up! certainly like your website but you need to test the spelling on quite a few of your posts. Several of them are rife with spelling issues and I to find it very troublesome to inform the truth however I will definitely come again again. I have to voice my gratitude for your generosity for people that really need guidance on in this field. Your personal commitment to passing the message around has been remarkably significant and have in every case helped most people like me to realize their objectives. Your warm and friendly publication signifies much to me and especially to my colleagues. Thanks a ton; from everyone of us. Simply wish to say your article is as astounding. The clarity in your post is simply cool and i could assume you’re an expert on this subject. Well with your permission let me to grab your RSS feed to keep up to date with forthcoming post. Thanks a million and please carry on the enjoyable work. What i don’t understood is in fact how you are now not actually a lot more neatly-favored than you might be right now. You’re very intelligent. You know therefore significantly when it comes to this subject, produced me personally consider it from so many varied angles. Its like men and women don’t seem to be involved unless it is something to accomplish with Girl gaga! Your personal stuffs great. At all times maintain it up! I have read a few good stuff here. Certainly worth bookmarking for revisiting. I wonder how much attempt you place to create this type of magnificent informative web site. I must convey my affection for your generosity supporting men and women who really want guidance on the idea. Your personal commitment to passing the message up and down appears to be exceptionally informative and have in every case made ladies much like me to attain their pursuits. The important facts can mean so much a person like me and somewhat more to my fellow workers. Thank you; from everyone of us. Hi, Neat post. There is a problem along with your website in internet explorer, may check this¡K IE still is the marketplace leader and a large section of other people will leave out your great writing because of this problem. I would like to thank you for the efforts you’ve put in writing this blog. I’m hoping the same high-grade blog post from you in the upcoming also. Actually your creative writing abilities has encouraged me to get my own website now. Really the blogging is spreading its wings quickly. Your write up is a great example of it. Hello very nice website!! Man .. Excellent .. Superb .. I will bookmark your site and take the feeds additionally¡KI am satisfied to seek out so many helpful info right here in the publish, we want work out extra techniques on this regard, thank you for sharing. . . . . .
you are in reality a just right webmaster. The web site loading pace is amazing. It kind of feels that you are doing any distinctive trick. Furthermore, The contents are masterwork. you’ve performed a wonderful activity in this matter! I in addition to my buddies ended up taking note of the excellent guidelines on your website and so the sudden came up with a horrible feeling I had not expressed respect to you for them. Those women ended up as a consequence thrilled to see all of them and already have definitely been making the most of those things. Appreciation for getting well kind and then for going for variety of very good useful guides millions of individuals are really wanting to learn about. My personal sincere apologies for not expressing appreciation to earlier. Thanks a lot for sharing this with all of us you really recognize what you are talking about! Bookmarked. Kindly also talk over with my web site =). We will have a link exchange arrangement between us! Valuable info. Lucky me I discovered your website unintentionally, and I am shocked why this twist of fate didn’t came about in advance! I bookmarked it. kamu bosan dan gak tidak tahu ingin bermain game apa?ayuk mencoba dengan game seru hanya di mgmpoker88 dan bisa menangkan dengan jutaan rupiah setiap harinya loh..
hello!,I love your writing so much! percentage we keep up a correspondence more about your post on AOL? I need a specialist in this space to resolve my problem. May be that is you! Having a look forward to look you. I do like the way you have presented this specific difficulty plus it really does give me a lot of fodder for thought. However, coming from what I have personally seen, I really hope as the reviews pile on that individuals stay on issue and don’t get started on a soap box regarding the news of the day. Anyway, thank you for this excellent point and while I do not concur with it in totality, I value the viewpoint. Hey there would you mind sharing which blog platform you’re working with? I’m planning to start my own blog soon but I’m having a difficult time selecting between BlogEngine/Wordpress/B2evolution and Drupal. The reason I ask is because your layout seems different then most blogs and I’m looking for something completely unique. P.S Sorry for getting off-topic but I had to ask! I¡¦ve been exploring for a little for any high quality articles or weblog posts in this sort of area . Exploring in Yahoo I eventually stumbled upon this website. Studying this info So i am glad to show that I have a very excellent uncanny feeling I came upon exactly what I needed. I most without a doubt will make certain to don¡¦t fail to remember this site and provides it a glance regularly. I do trust all of the ideas you’ve presented for your post. They are really convincing and will certainly work. Nonetheless, the posts are very quick for novices. Could you please lengthen them a bit from next time? Thank you for the post. Hiya, I am really glad I have found this info. Today bloggers publish only about gossips and internet and this is actually annoying. A good web site with exciting content, that’s what I need. Thank you for keeping this website, I will be visiting it. Do you do newsletters? Cant find it. Thank you, I’ve recently been searching for info about this topic for ages and yours is the greatest I have discovered so far. However, what about the bottom line? Are you positive in regards to the source? Thanks for sharing superb informations. Your site is so cool. I’m impressed by the details that you¡¦ve on this site. It reveals how nicely you understand this subject. Bookmarked this website page, will come back for more articles. You, my friend, ROCK! I found just the information I already searched everywhere and just could not come across. What an ideal website. whoah this blog is magnificent i love reading your posts. Keep up the great work! You understand, a lot of individuals are searching around for this info, you could aid them greatly. Hello there, I discovered your web site by the use of Google at the same time as searching for a comparable subject, your site came up, it seems good. I have bookmarked it in my google bookmarks. It’s perfect time to make some plans for the future and it is time to be happy. I’ve read this post and if I could I desire to suggest you some interesting things or advice. Maybe you could write next articles referring to this article. I desire to read more things about it! Hi there very nice site!! Guy .. Beautiful .. Superb .. I will bookmark your website and take the feeds also¡KI’m satisfied to seek out numerous helpful information right here within the publish, we want work out more techniques on this regard, thank you for sharing. . . . . .
stumbleupon on a daily basis. It will always be interesting to read content from other writers and practice something from their websites. I simply want to mention I am newbie to blogging and honestly liked this page. Most likely I’m planning to bookmark your website . You really come with good posts. Thanks a bunch for revealing your web-site. I¡¦m no longer sure where you are getting your info, however good topic. I must spend some time finding out more or working out more. Thank you for magnificent info I used to be in search of this information for my mission. A lot of thanks for all of the labor on this web page. My daughter loves working on investigations and it’s easy to see why. All of us learn all of the dynamic way you create informative tricks through your web blog and as well as strongly encourage participation from people on the topic then my princess is truly learning a lot. Take pleasure in the rest of the year. You are conducting a wonderful job. obviously like your web site but you need to check the spelling on quite a few of your posts. Several of them are rife with spelling issues and I find it very bothersome to tell the truth then again I¡¦ll surely come again again. I simply want to tell you that I am just newbie to weblog and definitely liked your web blog. Very likely I’m likely to bookmark your site . You actually come with amazing writings. Thank you for sharing your web-site. Magnificent website. Plenty of helpful information here. I¡¦m sending it to a few pals ans additionally sharing in delicious. And obviously, thanks on your sweat! Thanks a lot for giving everyone a very special possiblity to read articles and blog posts from this web site. It’s usually so sweet and also packed with fun for me and my office fellow workers to visit your blog a minimum of three times every week to learn the newest guidance you will have. Not to mention, I’m always contented with your superb knowledge you serve. Some 3 areas on this page are ultimately the finest I have had. You actually make it appear really easy with your presentation however I in finding this matter to be actually something which I believe I’d never understand. It seems too complicated and extremely broad for me. I am having a look forward on your next post, I’ll try to get the grasp of it!